Dreaming in Beauty: Cupcake to the Rescue! So I'm currently experiencing one of the worst breakouts ever. I haven't implemented anything new into my skincare regimen or changed anything in my diet so I'm assuming the change in weather here has to do with it because I know a few of my friends have experienced the same thing. I was home last weekend and I knew I had to start the healing process of the acne thats come up only on my jawline and cheek of one side of my face (weird I know). I decided I needed to pick up the cupcake face mask from LUSH which I've samples of before and knew helped with some breakouts. 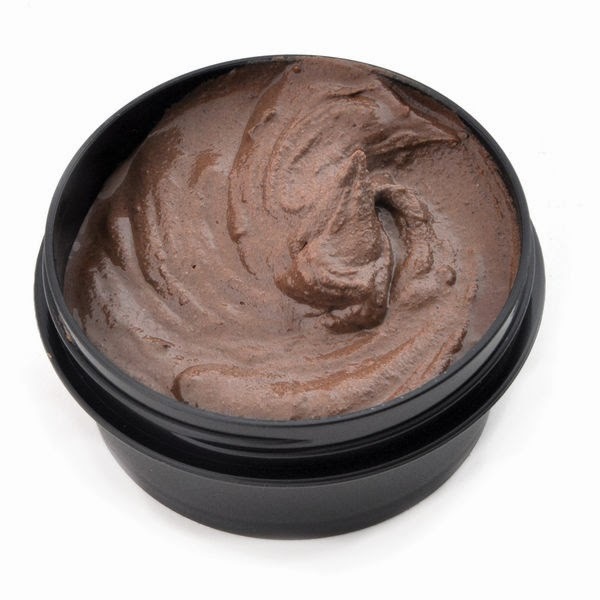 It's fresh, it looks look chocolate on your face, its only $6.95 CAD but it only lasts 2 weeks. You can use it roughly 2-3 times a week so I'm probably going to lean more towards 3 times a week to dry out my spots. It's not drying on the skin and you're skin feels great and clean after you use it, all the ingredients are natural, hence why it goes bad so soon. I've noticed in a week my spots have shrunk, not gone away but I didn't expect them to magically disappear since they were really bad. My pores feel less clogged and I've noticed I'm less oily since I started implementing this into my weird breakout period. I'm not sure how this mask would work on cystic acne because I don't have it anymore since I went temporarily on an oral medicine over the summer from my dermatologist. The medicine seemed to stop them from returning even after I stopped using them which was nice. Cystic acne is from within so I don't feel like this mask would help much for it. I do however recommend it to anyone with oily acne prone skin that's suffering a breakout or just wants to be prevent any spots from coming up due to a weather change or hormonal stress issues. It's definitely the best fresh face mask from lush I've used, I wasn't a fan of catastrophe cosmetic (the blueberry one I think), it did nothing for my acne and I know it bothered my sister and made her face feel tight after which is bizarre because it's meant for sensitive skin. What are your secrets for battling a breakout? Have you tried Cupcake mask? Do you have any of the Revlon Lip Butters?? I want to get a good shade for the fall/winter... do you have a shade to recommend? I don't have any of them because most of the time they've been damaged when I've gone to check them out but I've swatched them in store and I can recommend a few of my favourite shades for the fall/winter months! I loved Raspberry Pie, Red Velvet and Berry smoothie out of the more deeper shades. They're really pigmented from what I've been able to tell and super creamy feeling. Let me know what you think about them and what shade you end up choosing! I ended up getting Red Velvet and am in love, i have Tutti Frutti from the summer but I wanted a darker shade. I had the same problem.. I wanted to get Raspberry Pie as well but they were all opened in Target... disaster! Hopefully next time!